Great video for a phone! Around about the same time as the world's first citizen journalists were finding an audience, Nokia launched a mobile phone that fully embraced pocket videomaking: the N93. It was the first phone that actually operated, and looked, like a camcorder. The downside? The dimensions weren't too far off a camcorder, either. Now Nokia is back with the N93i - a significantly different looking beast. Have they made enough improvements on the inside to warrant an upgrade? Despite fantastic handling and a true camcorder experience from a mobile phone, there was no getting away from the fact that the N93 was too bulky and unlikely to attract anyone other than the camcorder gadget devotee. The new look N93i should change all that. With its slick reflective silver fascia and the OLED cleverly fitted within this, the N93i has more than a little of the futuristic about it, and will win admirers with its compact and stylish design. Although the Zeiss optics are mounted at the side of the phone, allowing you to flip the LCD and hold it like an upright cam, the display is considerably less bulky than the previous model, feeling like the perfect camcorder/phone hybrid - and proving adept at functioning as both. A very basic control layout is mounted on the right flank of the phone, so when you flip to 'camcorder' mode everything can be operated easily. You also have full functionality of the menu system when using the conventional keypad layout. Thanks to the rotating LCD, playback is also as convenient as possible, with the display folding in a manner that makes for landscape widescreen footage playback. The N93i is more to do with design improvements than an overhaul of the features list. There are four quality settings, with the best shooting at 640 x 480 resolution, 30fps, and the lowest quality suited to files for sharing with other mobile users. Shooting modes are limited - you can't really expect the full array found on standard camcorders - with an automatic setting and a night mode, and five white balance settings to choose from. There are also four colour effects. Although the N93i comes with Premiere Elements 3, there is also the built-in onboard editor that is more sophisticated than anything we've seen on a camcorder. It's possible to cut clips, edit them together using digital effects and alternative audio tracks, then upload them to the web - you can place you N93i movies on the Vox videoblogging service - all from one device. Incredible. Transferring footage from the phone is an absolute breeze and initial results impress. Although we are a long way off traditional camcorder performance here the N93i, like the N93 before it, is astounding for a phone. In natural light, and shooting fairly flat colours this camphone is capable of a loyal performance, with minimal colour bleed and fair levels of detail. The real problems begin, however, when you are shooting vibrant colours or in low light, and the N93i really struggles. Bright reds become painfully oversaturated, edges lose definition as colour spills over and grain is present. Although an onboard light and a night mode are available they do very little to help. Audio, too, struggles, with a limited pick-up range, and too much handling and mechanical noise obvious on soundtracks. It's not all bad news, though - the digital stills fare better, with minimal noise and good levels of contrast. This is still a must-have video phone gadget - the new look is stunning and the phone is still packed to the rafters with great features. The problem is, while significant improvements have been made to the design, it appears very little has been done to soup up the image performance. And while this cam will take on the best of the MPEG4 market, there is still definitely room for improvement. 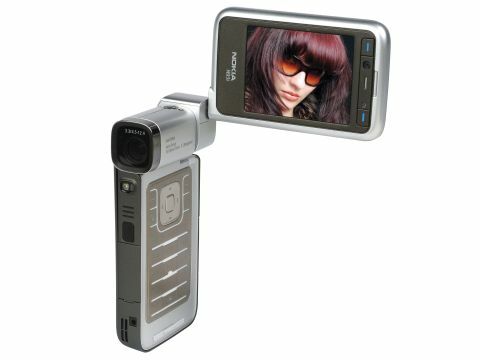 This cameraphone looks the business, and is ideal as the ultimate pocket video gadget. However, while the design has improved, not enough has been done to up the ante when it comes to video performance. Although there is plenty to be pleased with.